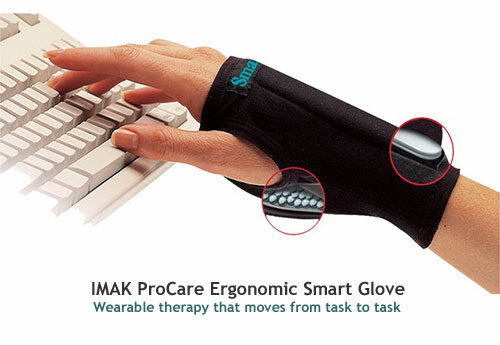 The Smart Glove® Wearable Wrist & Mouse Pad incorporates soothing, moldable, softbeads that properly raise and support your wrist in a neutral, ergonomic position, whereever the task; whether at your laptop computer, iPAD, Surface, favorite tablet, or writing the old way, there is no other support that moves with you perfectly from task to task. Allows writing and full function of the hands with amazing comfort. Acts like therapy while your work. Works better than conventional pads because it is always there and while providing slight compression support giving the interosseous membrane in the wrist a chance to heal. Laxity or injury to the interosseous membrane of the wrist has been implicated as a major cause of Carpal Tunnel Disorders. The Smart Glove®, patent pending, was developed by Ian MacMorran, M.D., an orthopedic and hand surgeon and tested on hundreds of his patients. Dr. MacMorran is an orthopedic and hand surgeon, as well as a qualified medical examiner with more than 25 years in private practice. He has a special interest in repetitive motion injuries and has treated thousands of patients suffering from carpal tunnel syndrome. Dr. MacMorran, concerned with patients' complaints about the lack of effective wrist splints available, invented the Smart Glove®.